The annual LONDON CRUISE SHOW takes place at Olympia 18-19 February. One company that will not be attending is All Leisure, now in administration, with Swan Hellenic amongst its cruise subsidiaries. Former chairman Roger Allard is to head a resurrection of Hebridean Princess, formerly part of the group, whilst the Swan Hellenic brand has been acquired by the international Canadian Group G Adventures. The popular Minerva is back with its owners. Hopefully a new operator will take over this fine ship. On the news front The World has broken the record for the most southerly navigation reaching 78°43•997´S and 163°41•421´W at the Bay of Whales in Antarctica’s Ross Sea. First introduced in 2003, The World, which describes itself as a (large) private yacht, comes in at 43,000 tonnes, has 165 residences and a crew of around 250. Later this year it will be in Monaco. The Cruise Lines International Association (CLIA) has released the 2017 State of the Cruise Industry Outlook, detailing a steady pace of cruise travel interest and significant investment in the industry. Increase in cruise travel is expected to continue throughout 2017, with an estimated 25.3m passengers expected to sail in 2017, a strong surge from 15.8m just 10 years’ prior (2007). More ships will set sail in 2017 as well. CLIA reports that cruise lines are scheduled to debut 26 new ocean, river and speciality ships in 2017 for a total investment of more than $6.8bn in new vessels From 2017-2026 the industry is expected to introduce a total of 97 new cruise ships totalling an estimated investment of $53bn through 2026. Cruise industry expenditures generated $117bn in total output worldwide, supporting 956,597 full-time equivalent employees who earned $38bn in income in 2015. The Scenic story began in 1986, when founder Glen Moroney began operating coach tours throughout Australia, quickly expanding into New Zealand, Norfolk Island, and South Africa. By the end of the decade Scenic was hosting tours to Canada and Alaska, and in 2008 launched its unique Space-Ships and began sailing the rivers of Europe. There has been steady expansion ever since with new ships every year now totalling 12 in Europe. This latest ship was built at Viana do Castelo (Portugal) to Glen's and his wife Karen's demanding standards. For the Douro there are special requirements due to restrictions caused by the size of the dams. Generally on most European cruise ship rivers the vessels are 135 metres long and carry up to 200 passengers (with Scenic it is just 169). On the Portuguese river the length is limited to 80m and Scenic carries 96 guests looked after by 36 crew. It is a very intimate top notch operation. In 2015 BTN took Scenic Emerald down the Rhône from Chalon-sur-Saône to Avignon. 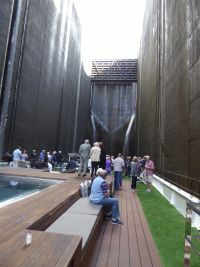 (See 2 November https://www.btnews.co.uk/article/9544) The ships are very similar except this time BTN booked the mid-passenger deck with a balcony, rather than the lower deck offering daylight only from a large window. Whilst the bedroom size (and the service) is much the same the window only cabin was found to be slightly claustrophobic. Pay for upstairs. It is well worth the extra. The other big difference is that on the Douro all the competing ships offer so-called swimming pools with Scenic deciding to add one too. For 2017 Emerald Radiance also has one. It is probably wonderful in mid-summer but had no takers (except your Editor in Chief) in October when this river cruise was taken. In truth it is more of a large whirlpool and hopeless for actually swimming. It should be described as a serenity pool. There is no room for the electric bikes which Scenic normally carries. Dining is the same with the two alternative restaurants optional on a couple of evenings, plus the main dining room with both Portuguese and international cuisine. It is buffet lunchtimes unless you do want service. Scenic is very much ‘all inclusive’ from the moment you step off your aircraft (or arrive by train) and it is very easy to finish up with a zero extras bill. Most drinks are free, there is no tipping, and the tours are included. If you visit the hairdresser or Wellness Centre that will cost. Wi-fi works very well. Every evening there is low key entertainment and just before dinner a briefing on the next day’s activities. The Douro is one of the great rivers of Europe, not that well known, and whilst over 500 miles long is navigable for just 130 miles. It is a river of wineries, which stretch up the escarpment for as far as one can see. Traditionally, the wine was taken down river in flat-bottom boats called rabelos, to be stored in barrels in cellars in Vila Nova de Gaia, across the river from Porto itself. It was here the British merchants from places such as Bristol established themselves from the 16th century onwards. 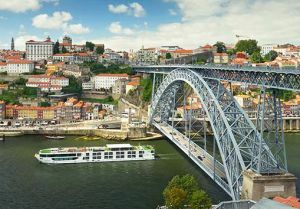 Scenic’s eight-day cruises start at Porto with Scenic Azure moored on the north bank of the city and a very short walk to the downtown areas. The established competitors are based on the south (Vila Nova de Gaia) bank, much less convenient for the main points of interest. 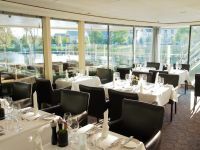 River cruise regulars should note that there is no night-time navigating and the suites are blissfully quiet, any evening musical activities taking place in the upstairs Panorama lounge towards the bow. During the 1970s and 1980s the Portuguese Douro was changed for ever with the building of five massive dams, the Pocinho, Valeira, Régua, Carrapatelo and Crestuma-Lever. Vessels with a maximum length of 83 metres (272ft) and width of 11.4 metres (37ft) pass through the five locks with the Carrapatelo Dam the largest and a maximum lift of 35 metres (115ft). It is very impressive. BTN has covered Porto in the past (see BTN 6 July 2015). Arriving via easyJet on an early flight one was collected and quickly hosted on board. And then there was time to see parts of the city new to us. On our first river day it was casting off Porto at 07:15 and on to Regua an important small town on the river, the Museu do Douro providing a showcase for the wine-making industry. Naturally sampling was included. Pinhoa was the night-stop. Unlike any other river (or indeed sea) cruise the on-board staff were made up entirely of Portuguese nationals. They were a great team. At every stop where a drive was required to the point of interest a pair of Scenic branded buses were ready for us. They followed the ship all the way up the river and even took us across the border (just a roadside sign) to Salamanca (Spain), the most easterly point on the trip. At Pinhoa, the next stop a visit to the Mateus Palace was selected, a fine baroque mansion but although depicted on the unique flask-shaped bottle is nothing really to do with the wine. Salamanca is a long two-hour drive from the river across what one can only describe as rather boring Spanish farming country. But once you get to the city it is visually striking and historically intriguing, the Moors arriving in 712. In 1812 it was the scene of one of Wellington’s great victories. It is a UNESCO World Heritage Site. Today it is Spain’s main seat of academia with 30,000 students. 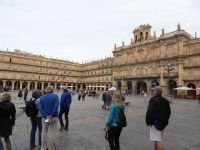 Salamanca has two churches, the Old Cathedral, of the 12th century and of Romanesque style, and the New Cathedral, much larger, built in the 16th century of Gothic style and completed in the 18th century, joined seamlessly. The Scenic guests enjoyed a fine lunch and an energetic Flamenco dance performance. Our return voyage included the remarkable hilltop village of Provesende, showcasing the Portugal of yesteryear. Wander the atmospheric streets of this quaint village with the locals as they proudly introduce you to their way of life – including their local bakery, and the bar with its wonderfully eclectic collection of regional wares. This is a specially choreographed experience only open to Scenic guests. We enjoyed a wine tasting at the restored manor house of Morgadio da Calçada. What better way to immerse yourself in the local culture. The trip finished with two nights at Porto, the first a celebration dinner at the Burmester Cellar by the famous double decked Dom Luís I (or Luiz I) Bridge and Fado music. The captain reminisced on our last night on board after a tiring but enjoyable day visiting the fishermen of Afurada and Guimarães, the seat of the first King of Portugal and dominated by the impressive Ducal Palace, which dates back to medieval times. Please note that these tours may or may not include travel to the port of arrival/departure. Some cruise lines include tipping and wine for the main meal, at least. Tours are usually included. Please check carefully. With these bargains BTN has been careful to select cruises from different European rivers in order to give a choice of itineraries and operators.